Service charities unite to launch SORTED! MEMBERS of the Armed Forces Community seeking a pathway to employment will benefit from the launch of “SORTED!”. SORTED! is a consortium of seven well-established Service charities supported by a new website and help line which will provide easy access to employment support for the benefit of the Armed Forces community, past and present. The group has been jointly developed by the seven charities, all of which currently provide different tailored employment support services. This is the first time Service charities have collaborated on this scale to provide employment support. SORTED! Chairman Steve Sherry said: “The launch of SORTED! will further enhance our excellent support to those in the Armed Forces community seeking meaningful and sustainable employment. “The collaboration of seven leading Services charities in a consortium with a new web portal and help line will quickly link individuals; Veterans, spouses and dependants, into the specific employment support they require. SORTED! members hope to see other like-minded organisations join this streamlining of service provision”. Mark Francois, the Minister of State for Defence Personnel, Welfare and Veterans, said it was “only right” that the Armed Forces’ contribution and sacrifice was recognised. He added: “That is why we are encouraging all sections of society to get behind the Covenant to support our Armed Forces Community in every way they can and make a real difference to their lives. Armed Forces Veteran Paul Harding faced real challenges after joining civvy street following 13 years service with the Royal Signals but has seen his situation improve thanks to help from SORTED!. He said: “I struggled to settle down and relate to people, and found myself withdrawing from society. My partner became so concerned about me that she sought professional help from our GP. I was diagnosed with Post Traumatic Stress Disorder, which explained a lot about how I was feeling. “Through the help of SORTED! charities, my PTSD was controlled, I found steady employment, developed my confidence and was able to showcase the range of transferable military skills I had to secure full time employment as a maintenance engineer. A SORTED! website has been designed to make the employment journey for the beneficiary straight forward and easily accessible. Key features include a simple questionnaire that individuals complete to ensure that they are referred to the most appropriate Service charity, which will have the expertise and knowledge to assist. The SORTED! Launch took place on 23rd September at the Honourable Artillery Company in London, and was attended by supporters from across Defence, industry and the military charity sector. Key speakers included Mark Francois MP, Minister of State for Defence Personnel, Welfare and Veterans and Mike Bickford, Head of Resourcing for Network Rail. The speakers offered their own unique perspectives on the sometimes-challenging transition from military to civilian life, the value of the Service charities and what Service leavers and Veterans can offer employers. SORTED! will also welcome the opportunity to work closely with other organisations and military charities, in order to enhance its comprehensive delivery to the Armed Forces community, both past and present. 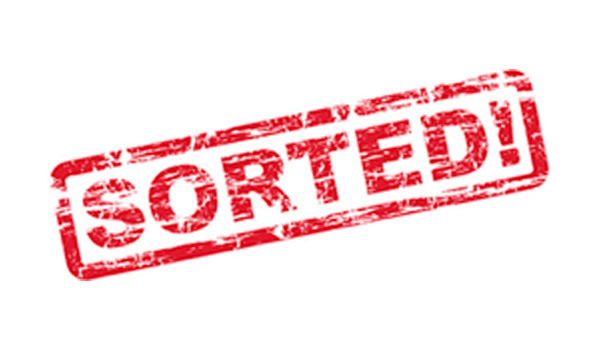 For more information on SORTED!, please contact Graham Liley, the SORTED! Development Manager on 07527 683845 or graham.liley@sorted.org.uk. The SORTED! website address is www.sorted.org.uk, and the help line is 0800 319 6845.